Our Classic White Hangers 24 Pack are a USA Made dorm necessity. It seems obvious that hangers are a must-have for dorm life, but they are easily forgotten. Making sure you have our Classic White Hangers is definitely a smart choice. The 24 Pack will provide you will enough hangers to hang up a significant amount of clothes and will aid your dorm closet organization. If you're looking for a great graduation gift for a college-bound student, our Classic White Hangers 24 Pack are a great option. You can't go wrong with a simple white hanger, and most college students can never have too many hangers or will underestimate the amount of hangers they need. It's never a good feeling to arrive at college and realize you're under-prepared. 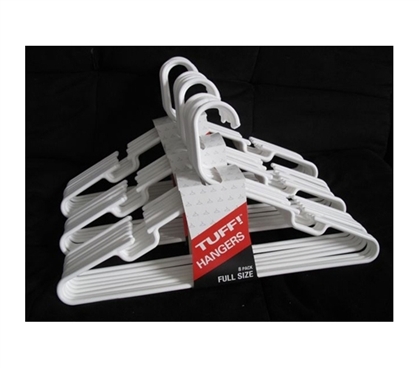 Help a high school grad that is headed off to university and treat them to a set of our Classic White Hangers 24 Pack.